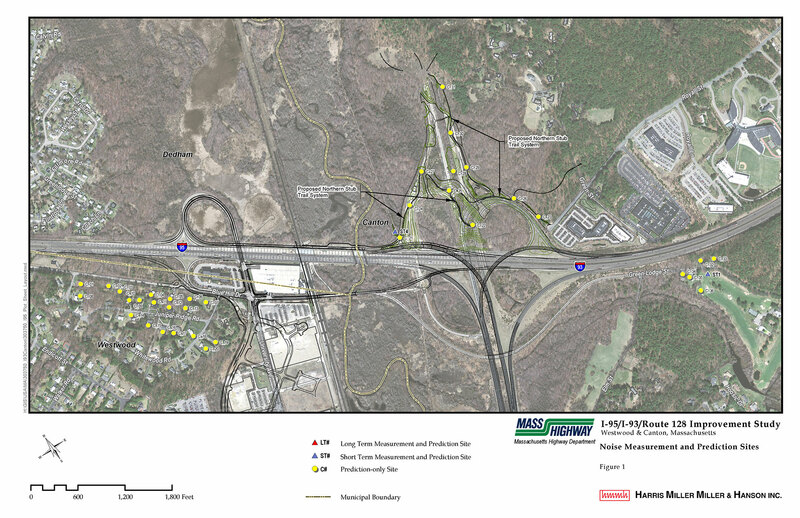 HMMH conducted a complete noise impact and abatement study for the Environmental Assessment for the proposed I-93/I-95 improvements in Canton and Westwood, Massachusetts. The noise study was recently updated to conform to the revised 2011 FHWA noise regulations under 23 CFR 772 and the Massachusetts Department of Transportation (MassDOT) updated 2011 noise policy. HMMH’s study involved short- and long-term noise measurements, noise modeling of the entire study area with the FHWA’s Traffic Noise Model (TNM), assessment of noise impact to residential and recreational areas adjacent to the highways, and evaluation of the feasibility and reasonableness of noise barriers to mitigate the noise impact. Under MassDOT’s revised noise policy, HMMH evaluated the noise impact and reasonableness of abatement for the nearby golf course and recreation areas based on the frequency of human use during busy periods. HMMH prepared a complete noise study report with tables of noise impact, graphics showing the project improvements and noise-sensitive receptors in the study corridor, and tables with details of the noise barriers evaluated for feasibility and cost-reasonableness.